Ah, there is nothing better than summer in the Pacific Northwest. It was these summers that made me decide to move to Portland in 1999 for college. It's these summers that always bring me back to this part of the United States and make me appreciate where I live (as if the coffee, wine, craft beer and flannel didn't already). Summer makes everything shine. What's at the Farmers Market? Cherries. So hot right now. Felon, criminal hot. Everywhere in Portland, people are talking about the cherries. Giving them out like a basket of candy at beer carts. Showing off their cherry bling upon entering a grocery store. Putting them on salad instead of tomatoes (they will have their day in due time). The latest farmers market raid consisted of Chelan cherries from Hood River, Little Gem lettuce, goat feta, hazelnuts and a bouquet of basil. I celebrated this loot by mixing everything together in a bowl. The fleshy, sweet cherries stole the show of course, but played well with the tangy feta, aromatic basil and crunch from the hazelnuts (I prefer to roast em myself). 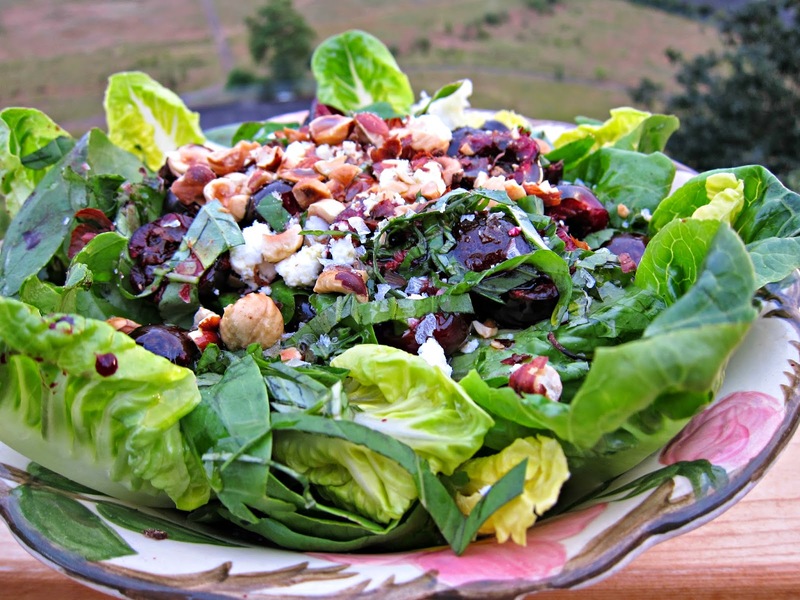 This salad was so fabulous and easy to make - so delicious I can't wait to make it again. Hope you are enjoying the Summer and get your hands on some of those cherries while they last! Chop up the little gems into bite-sized pieces. Save the inner leaves for outside decor if you want. 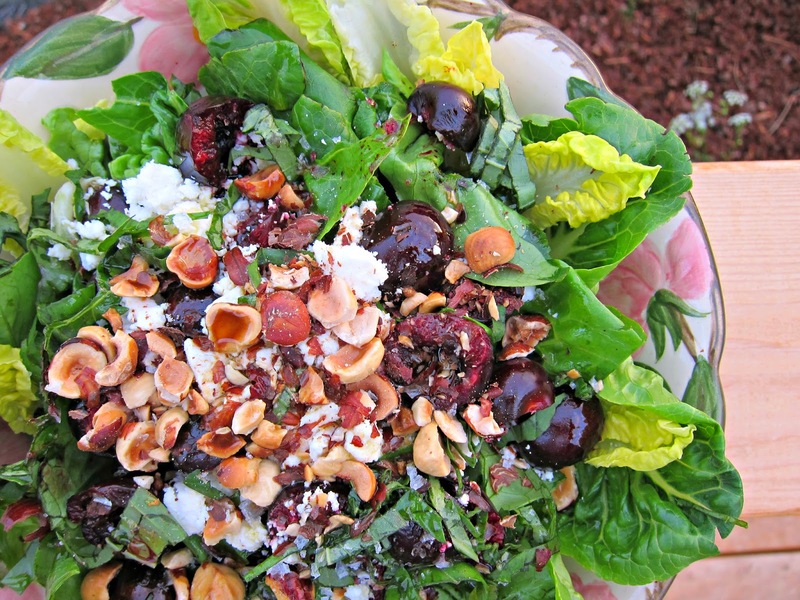 Throw in cherries, basil, feta and hazelnuts. Drizzle with olive oil, sprinkle with salt and pepper to taste. Wow, This looks delicious! Will definitely have to try this one. There's created for every character after looking in Europe Marketer designer designer watches. Every one of them timepieces carries a Three year or so company's extended best imitation Panerai watches warranty. You do not require an temptation to get this name enjoy mainly because it has cheap replica handbags made past depend upon along using confirmed his or her fineness in quality so that it a crucial watch. You are unable to obtain anything additional with regards to a watch. Tha unpleasant replica watches UK truth because of the query regarding no matter if Tag Heuer developer watches (normally shortened that you can 'Tag') hold their price tag or not is simply -- you will definately get whatever you purchase! If purchased a synthetic version Tag or possibly a cheap on a Swiss Replica Watches UK daily basis observe there after naturally it will not support the retail price, maintain replica Louis vuitton handbags your seems and also last so long as.